Summary. Aim: To study a rare clinical case of isolated primary osteoma localized in the frontal bone, provide its detailed clinical and pathomorphological analysis, and evaluate statistical indicators of occurrence frequency and localization of facial skeleton osteomas during 2006–2015. Materials and Methods: The retrospective case records analysis of patients undergoing treatment in the ma­xillofacial department of Lviv Regional Clinical Hospital and suffering from facial skeleton osteomas was conducted. The clinical examination was carried out in accordance with the inspection protocol required for the examination of patients diagnosed with tumors and tumor-like neoplasms in a particular clinical case. Frontal and lateral views were used in the course of X-ray imaging. Histological studies included macroscopy and microscopy. Results: According to the retrospective case record analysis made over the last 10 years 346 cases of facial bone osteoma were revealed and proved histologically comprising 3.7% of all benign osteogeneous maxillofacial tumors. For the first time in 10 years osteoma localized in the frontal bone had been revealed and thoroughly studied. Macroscopically — a semi-spherical and immovable neoformation 7 cm in diameter of hard consistency, splaying out at 4 cm and being adherent with the frontal bone. Roentgenologically — homogeneous intense shadowing of a round form with relatively distinct outlines complying with clinical sizes. 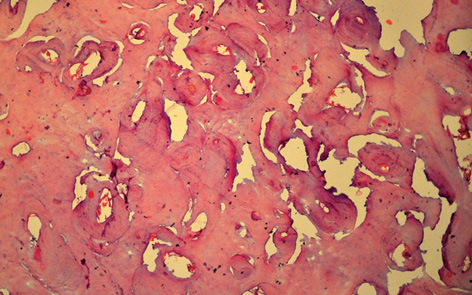 According to the histological data, the tumor consists mostly of the solid osseous tissue and the spongy osseous tissue with the evident thickened trabeculas of the bone located in different directions. Conclusion: The analysis of historical data demonstrated extremely rare localization of primary osteoma of the frontal bone, and indicated the uniqueness of the case and significant clinical importance of its detailed study. Osteoma is a benign tumor of a mature osseous tissue equally suffered by men and women. Statistically osteoma comprises about 4% of all primary nonmalignant maxillofacial tumors [1–3]. Osteoma is preceded by a mechanical injury (32.1%) presumably serving as an agent stimulating “dormant” embryonic cells for the blastomatous growth [4–6]. Osteoma mainly affects mandibular and maxillary bones, less frequently temporal bones, is localized in the nasal cavity, paranasal sinus and orbit. The cases of frontal bone damage are occasional [7–10]. Osteoma grows slowly and painlessly. Its clinical signs depend on the neoplasm size, localization and growth direction. Morphologically osteoma is similar with the common osseous tissue. Treatment involves a surgical intervention with a radical removal along the healthy bone [11, 12]. 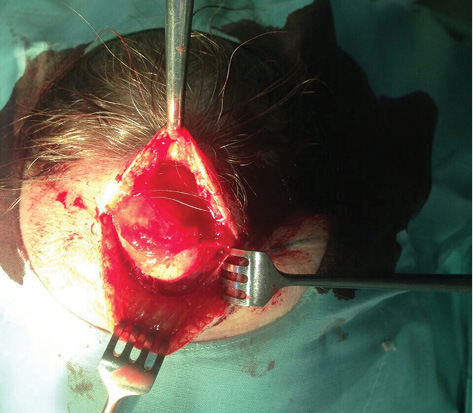 A rare case of the isolated frontal bone osteoma is described in this research. The retrospective case records analysis of patients undergoing treatment in the maxillofacial department of Lviv Regional Clinical Hospital and suffering from facial skeleton osteomas. The clinical examination was carried out in accordance with the inspection protocol required for the examination of patients diagnosed with tumors and tumor-like neoplasms. Frontal and lateral views were used in the course of X-ray imaging. Macroscopic examination of the graft consisted of its visual evaluation and palpation (the form, colour and density) and its correlation with the surrounding tissues. Pathohistological study № 17604–9/2016 was accomplished in the Regional Pathoanatomical Bureau of Lviv following the commonly used method invol­ving the decalcination of the tumor parts under study and hematoxylin-eosin staining of histological agents . Microscope Nikon E200 with photocamera Nikon 5000 of ×40, ×100 and ×400 zoom was applied for taking micro photos. According to the retrospective case record analysis made over the last 10 years (2006–2015) 346 cases of facial bone osteoma were revealed and proved histologically comprising 3.7% of all osteogeneous benign maxillofacial tumors. In particular, 120 cases of maxilla osteoma were observed (34.68%), 28 (8.10%) of which were of central structure and 92 (26.57%) were peripheral (mainly exostosis). Mandibular osteomas were almost twice as often observed — in 204 (58.96%) cases including central osteoma — 110 (31.80%) cases and peripheral — 94 (27.17%) cases. Zygomatic bone ostemas were revealed in 6 (1.73%) patients. Tumors invading in the maxillary sinus were by far less frequent being evident only in 11 cases (3.18%) and nasal ca­vity osteoma was even more rare and revealed in only 3 (0.87%) cases, frontal sinus osteoma was scarcely ever revealed — only in 2 cases (0.58%). No clinical case of the isolated frontal bone osteoma was diagnosed in the maxillary-facial department of Lviv Regional Clinical Hospital during 2006–2015. The only case when a patient diagnosed with the frontal bone osteoma was admitted to hospital in the middle of 2016 is described below. 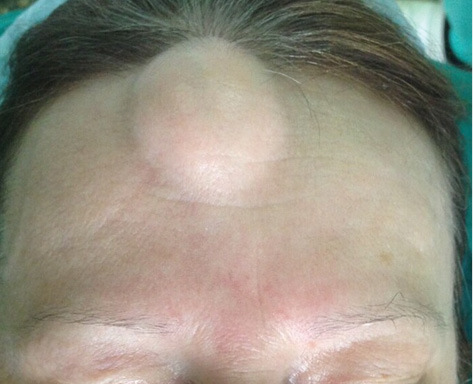 Patient M., aged 64, consulted a doctor regarding a big size frontal external neoplasm. According to the patient’s words, the first tumor signs appeared over 30 years ago. Osteoma growth was slow and absolutely painless until the moment when it started causing the aesthetic discomfort. The initial examination showed a round semi-spherical and immovable neoformation of 7 cm in diameter with hard consistency, splaying out at 4 cm and being adherent with the frontal bone in the center. The skin colour over the neoformation was not changed, was relatively moveable but hardly folded up (Fig. 1). The plan radiography of the facial skeleton showed the signs of homogeneous intense shadowing of a round form with relatively distinct outlines complying with clinical sizes and neoformation localization. Frontal sinus pneumatization was preserved (Fig. 2). Tumor ectomy (excisional biopsy) was carried out under the general anesthesia. Neither intimate neoplasm fusion with the surrounding soft tissues nor the evident velamen were revealed. Intraoperative palpation and instrumental examination showed that the hard tissue tumor was more solid and indurated than the healthy bone, the transitional site was clearly observed. Trepanation was hardly possible (Fig. 3). According to the histological study the tumor consists mostly of the solid osseous tissue (Fig. 4) and the spongy osseous tissue (here and there) (Fig. 5) with the evident thickened trabeculas of the bone located in different directions. In conclusion, after the statistical data has been processed by using the archival findings obtained over the last decade, it may be affirmed that maxillofacial osteoma is not a widely spread pathology. On the other hand, the lack of facts about the localization of the frontal bone initial osteoma proves the unique character of the described above clinical case and a great importance of its being investigated in details. 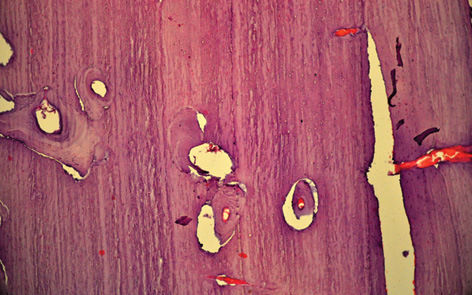 Subject to the macroscopic study, the long-lasting and free growth of the osteogeneous tumor manifested as the evident osseous overlaying was confirmed and the character of the thickened bone trabeculas located in a random way points at some pathohistological signs of the compact osteoma. Acknowledgements to Associate Professor of Patho­logical Anatomy Department of Danylo Halytsly Lviv National Medical University, Doctor of Science, Volodymyr Vovk for collaboration in morphology stu­dies. Malanchuk VO, Kopchak AV. Benign tumors and tumor-like lesions of the neck and maxillofacial area. Kyiv: Publishing house Askania, 2008; 320 p. (in Ukrainian). Dell’Aversana O, Salzano G, Iaconetta G, et al. Facial osteomas: fourteen cases and a review of literature. Eur Rev Med Pharmacol Sci 2015; 19: 1796–802. Fernando D, Shpotin V. Giant osteomas of the frontal and temporal bones. Doctor 2015; 10: 61–3. Herford A, Stoffella E, Tandon R. Osteomas involving the facial skeleton: a report of 2 cases and review of the literature. Oral Surg Oral Med Oral Pathol Oral Radiol 2013; 115: 1–6. Sasidharan A, Gohil A, Koshy S, Gupta AK. Bony tumor in an unusual location on the mandibl. Indian J Plast Surg 2015; 48: 200–3. Shakya H. Peripheral osteoma of the mandible. J Clin Imaging Sci 2011; 1: 56. Plaksyvyi OG, Nezboretskyi IV, Kalutskyi IV, et al. Variants of clinical flow of frontal and ethmoidal sinuses osteomas combined with pyocele, chronic polypose sinusitis and penetration into the scull cavity. Rhinology 2010; 2: 56–62 (in Ukrainian). Kornyshchenko SA, Bolosneva EV. Endoscopical surgery of paranasal osteomas. Announcer Otolaryngol 2016; 4: 42–4 (in Ukrainian). Hrusha YO, Fedorov AA, Ismailova DS, et al. Rear case of primary osteoma of orbit. Announcer Ophthalmol 2015; 6: 76–81 (in Ukrainian). Pokrovskaya EM, Krasnozhan VN. Clinical observation of maxillary sinus osteomas. Announcer Otolaryngol 2015; 6: 87–8 (in Ukrainian). Kaplan I, Nicolaou Z, Hatuel D, Calderon S. Solitary central osteoma of the jaws: a diagnostic dilemma. Oral Surg Oral Med Oral Pathol Oral Radiol 2008; 106: 22–9. Mehta R, Yadav A, Bansal SP, Deshpande MD. Solitary periosteal osteoma of the mandible: a case report. Sultan Qaboos Univ Med J 2014; 14: 145–8. Sarkisov DR, Perov YL. Microscopic technique. Moscow: Medicine, 1996; 542 p. (in Russian).